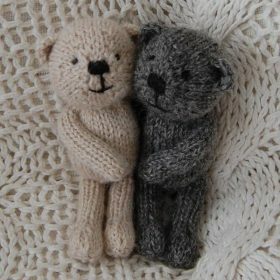 The Knitted Bear Company is the business that owns and manages this website. We are committed to protecting your privacy and maintaining the security of any personal information we receive from you. We strictly adhere to the requirements of the data protection legislation under EU General Data Protection Regulation (Regulation (EU) 2016/679) and EU ePrivacy Regulation (ePR). – the right not to be subject to automated decision-making, including profiling. This means that we will request explicit consent for the collection and holding of personal data and for processing it for specific purposes, as described below. If you follow us on third party platforms such as Facebook, Twitter or Pinterest, you will be relying on their data protection and not ours. – to our delivery partners (DPD, Royal Mail, Parcel Force) solely for the purpose of effecting delivery of your order. We normally store most information electronically in our computer system, which has encryption, anti-virus and malware protection measures, and back-up facilities. Some information is stored remotely in the cloud. Some information such as past orders, is additionally stored in paper format and we do store this for as long as possible to make it easier to discuss future orders with customers. Normally we will not destroy this paper or electronic information unless and until notified by you that it should no longer be kept as we know that some of our customers rely on this for future orders even after a gap of several years. We will not give past order information to anyone other than the specific customer unless requested to do so by that customer. We will normally archive information on people who have not been in touch with us for six years and destroy information on people who have not been in touch with us for more than ten years unless we are legally obliged to retain it. Where we receive payments in our online shop, we use a secure payment service, WorldPay, so that all your data is protected by their systems. We are obliged to undertake regular monitoring to comply with the PCI-DSS (Payment Card Industry Data Security Standard) system run by banks and payment processors to ensure this. We do not accept any payment information by email or post so please do not send it to us. If you wish to make a phone payment we process either directly onto our machines from your instructions or immediately shred the information once it has been successfully used. This does mean that you will have to give us this information every time you wish to undertake a transaction in this way. We can also receive payments via BACS, which is quick and secure. Our bank details will be provided on request. As keeping information about you secure is important to us, the website uses SSL encryption, or a comparable standard, for data transmission. Our website contains links to other websites that you may find of interest. Please note that once you have used these links to leave our site, we do not have any control over the other website. We can not, therefore, be responsible for the protection and privacy of any information which you provide while visiting other sites not governed by this privacy statement. Please exercise caution and look at the privacy statement applicable to the website in question. – If you have previously agreed the use of your personal information to receive our newsletter but wish to unsubscribe from it you may do so by using the link provided in any of our newsletters. Alternatively, let us know in writing, or email us at mail@theknittedbearcompany.co.uk. You may ask us to remove all or part of the information about you and we will do so, confirm to you that we have done so and then hold a record to show that we have done this, which will therefore include your name and contact details for legal compliance reasons.If you wish to have any part of the information we hold about you removed please write to us at the above address. If we change this policy, which we may do occasionally, this page will be updated as appropriate. So to ensure that you are happy with any changes, you should check this page from time to time. This policy is effective from 16 April 2018.